Heat oven to 400°F. Spray large cookie sheet with cooking spray. Unroll dough on cookie sheet; starting at center, press out dough into 15x10-inch rectangle. Brush with 1 tablespoon of the oil; sprinkle with herbes de Provence. Meanwhile, in medium bowl, mix tomatoes, olives, garlic, remaining 2 tablespoons oil, the chopped basil, pepper and salt. 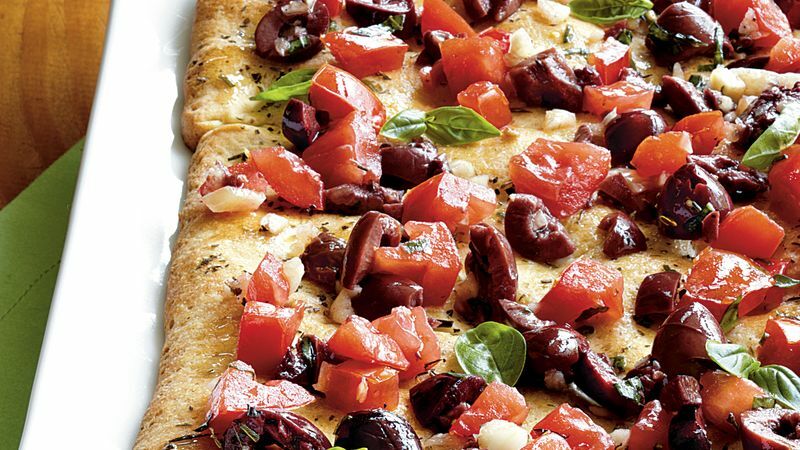 Cut flatbread into 24 pieces. Top evenly with tomato mixture. Garnish with basil leaves. Herbes de Provence is a blend of herbs that thrive in the southeastern tip of France, typically thyme, summer savory, fennel, basil and lavender flowers. It is readily available online or in local kitchen supply stores.